The area can be complicated and stressful which is the last thing needed when moving home. If you are buying a property, you should instruct solicitors who have your best interests at heart. There are many aspects that need to be explored to make sure you are aware of any risks when buying a particular property. Buying or selling a property can be one of the most stressful experiences in life. They are probably the biggest and most expensive transactions that people will ever enter into. 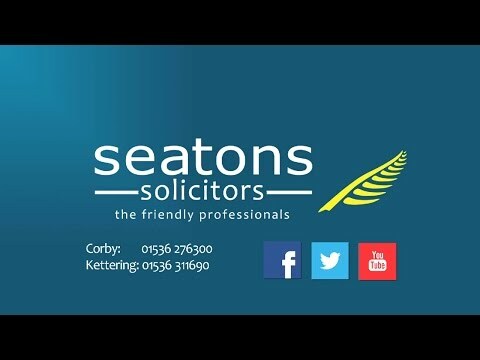 At Seatons, our experienced team of solicitors can help guide you through this confusing process. Below is our easy to understand, step by step guide to buying a house. If you have any questions, then give us a call on 01536 276300 for a free no obligation chat and receive a quote. As soon as your offer has been accepted, we will ask the seller’s solicitors for a first draft of the contract. A form listing the fittings and contents included in the sale will also be provided and we will run through this with you to ensure everything is in order. Once received we will conduct a number of searches on the property. These can include Local Searches, Water Searches, Land Registry Searches and Mining Searches, among others. The Local Search is the most common and involves searching against the Local Authority’s records relating to the property. This includes checking planning permissions, building regulation approvals, proposed developments in the area, that the drains are mains connected, roads are adopted, and all sorts of other queries. Having received contract documentation from the sellers solicitors the paperwork must be fully reviewed by your conveyancer and any necessary enquiries raised as a result of this review. Enquiries can range from anything from ensuring a boiler has an up to date boiler service to a complex issue regarding the title deeds to the property. Matters cannot proceed to exchange of contracts until the sellers solicitors have replied to all enquiries sufficiently and to the satisfaction of your solicitor/conveyancer. In the meantime, you need to ensure that your financial arrangements are in place and that, if you are borrowing money for buying a house, you have submitted your mortgage application. If this is the case, your mortgage lender will need an independent valuation of the property. They will often appoint their own surveyor to do this and the costs will be paid for by the purchaser. We always recommend that a full and comprehensive survey and report be carried out prior to the purchase of any property whether a mortgage is being obtained or not. These can cost anything from £250 but can help reassure and confirm that the property is structurally sound before the deal becomes legally binding. As soon as we have all the information we need, we will discuss with you everything to do with the property, explaining each detail in plain English, and let you know if it is still safe to proceed with the purchase. Once you are satisfied with everything, you will be asked to sign the contract and transfer the deposit to ourselves that will be given to the seller upon exchange of contracts. It is at this point when we will liaise between you and the seller to agree on a completion date upon which the house will become yours and you can officially move in. Your Solicitor will not report to you to sign until they are satisfied with all aspects of the purchase before committing you to the property. This is the crucial moment of the agreement between you and the seller. Providing you and the seller still wish to proceed with the sale, we will send the contract for the purchase of the house and the deposit over to the seller’s solicitors. In exchange, you will receive the contract the seller has signed. The contracts have now been exchanged and the deal is legally binding. Between exchanging contracts and the completion date, we will take the mortgage money from your lender and provide you with a clear statement for any additional costs. These will include legal fees, Land Registry fees and Stamp Duty tax. If there is a short time between exchange and completion we would normally ask for the full monies due from you to be provided before exchange of contracts to avoid any delay on the day of completion. On completion day, we electronically transfer the remaining purchase monies still owed to the seller’s solicitors and the keys are released to you once the solicitors confirm receipt of the monies into their account. Your property transaction has been successful and you are now free to move into your new home. What Is The H.M Land Registry? The Land Registry is a government department that documents and records details of all titles to land and issues certificates guaranteeing the title when it is registered. Think of it as being a similar set up to the D.V.L.A. Every property transaction must be registered and a fee is payable on registration by the buyer. Land Registry fees vary depending on the price of your new property. They can be from as little as £40 but usually more in the range of £100 to £200 (if you are buying in the £80,000 – £200,000 price range). At Seatons, we offer a fast and efficient service to ensure there are no delays and that your property transaction runs as smoothly as possible. Our team of specialist conveyancers have a wealth of experience in their field and talk to you in plain English; offering clear, helpful, pragmatic advice without the confusing legal jargon. We always aim to be available to talk to you, whatever the query, and will keep you regularly updated with any news as it arrives. We also offer low sensible fees with clear, easy to understand quotes and never charge any hidden extras or additional costs. Give us a call on 01536 276300 for a free no obligation chat and receive a quote.